A special prayer in Hebrew and English for the United States and "His Excellency George Washington, Captain, General and Commander in Chief of the Federal Army of these States," was read by the Reverend Gershom Mendes Seixas at the Consecration Service of the new synagogue of Congregation Mikveh Israel, in Philadelphia on April 3, 1782. Seven years later, Washington, now the newly elected president of the United States, was again the recipient of expressions of adulation and felicitations from American Jewish congregations. In the Washington Papers at the Library of Congress are the original addresses to him from the Hebrew Congregation in Newport, Rhode island, and the Hebrew Congregations in Philadelphia, New York, Charleston, and Richmond. Also present are the retained copies of the president's replies to them and to the Hebrew Congregation of the City of Savannah. These are but the first of a large number of letters from Jewish organizations and from individual Jews to and from American presidents in the Library of Congress, which is the depository of the papers of all the presidents from George Washington to Calvin Coolidge, with the exception only of John Adams. Some such letters in the papers of Washington, Jefferson, Madison, and Lincoln should be allowed to speak for themselves. The first Jewish community to address the newly elected George Washington was the Hebrew Congregation of Savannah, Georgia, on May 6, 1789. "Our eccentric situation," Levi Sheftal writes in behalf of the congregation, "added to a diffidence founded on the most profound respect has thus long prevented our address." The congregation declares itself beholden to Washington for his "unexampled liberality and extensive philanthropy [which] have expelled that cloud of bigotry and superstition which has long, as a veil, shaded religion-unrivetted the fetters of enthusiasm enfranchised us with all the privileges and immunities of free citizens, and initiated us into the grand mass of legislative mechanism." I rejoice that a spirit of liberality and philanthropy is much more prevalent than it formerly was among the enlightened nations of the earth, and that your brethren will benefit thereby in proportion as it shall become still more extensive; happily the people of the United States have in many instances exhibited examples worthy of imitation, the salutary influence of which will doubtless extend much farther if gratefully enjoying those blessings of peace which (under the favor of heaven) have been attained by fortitude in war, they shall conduct themselves with reverence to the Deity and charity toward their fellow- creatures. May the same wonder-working Deity, who long since delivered the Hebrews from their Egyptian oppressors, planted them in a promised land, whose providential agency has lately been conspicuous in establishing these United States as an independent nation, still continue to water them with the dews of heaven and make the inhabitants of every denomination participate in the temporal and spiritual blessings of that people whose God is Jehovah. 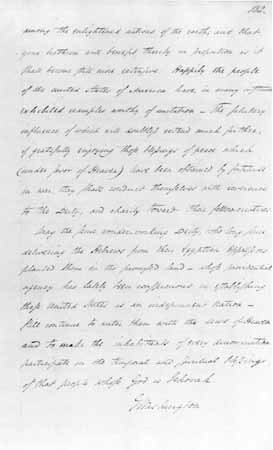 Manuscript Division, Papers of George Washington. Sir:-It is reserved for you to unite in affection for your character and person every political and religious denomination of men; and in this will the Hebrew congregations aforesaid yield to no class of their fellow- citizens. ... The wonders which the Lord of Hosts hath worked in the days of our Forefathers, have taught us, to observe the greatness of His wisdom and His might throughout the events of the late glorious revolution; and while we humble ourselves at His footstool in thanksgiving and praise for the blessing of His deliverance; we acknowledge you, the Leader of American Armies, as his chosen and beloved servant; But not to your sword alone is present happiness to be ascribed; that, indeed, opened the way to the reign of Freedom, but never was it perfectly secure, till your hand gave birth to the Federal Constitution, and you renounced the joys of retirement to seal by your administration in Peace what you had achieved in war. To the eternal God, who is thy refuge, we commit in our prayers the care of thy precious life; and when, full of years, thou shalt be gathered unto thy people, thy righteousness shall go before thee, and we shall remember, amidst our regret, "that the Lord hath set apart the godly for himself," whilst thy name and thy virtues will remain an indelible memorial on our minds. 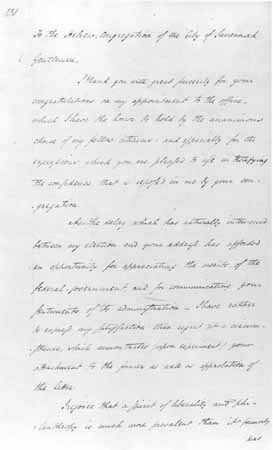 President Washington received this congratulatory address from the Hebrew Congregations in Philadelphia, New York, Charleston, and Richmond, written by Philadelphian Manuel Josephson "on behalf and under the authority of the several congregations." This marked the first joint endeavor by a united American Jewry, comprising the leading communities of the North and the South. To the HEBREW CONGREGATIONS IN THE CITIES OF PHILADELPHIA, NEW YORK, CHARLESTON, AND RICHMOND. Gentlemen:-The liberality of sentiment toward each other, which marks every political and religious denomination of men in this country, stands unparalleled in the history of nations. The affection of such a people is a treasure beyond the reach of calculation, and the repeated proofs which my fellow-citizens have given of their attachment to me and approbation of my doings form the purest source of my temporal felicity. The affectionate expressions of your address again excite my gratitude and receive my warmest acknowledgment. The power and goodness of the Almighty, so strongly manifested in the events of our late glorious revolution, and His kind interposition in our behalf, have been no less visible in the establishment of our present equal government. In war He directed the sword, and in peace He has ruled in our councils. My agency in both has been guided by the best intentions and a sense of duty I owe to my country. And as my exertions have hitherto been amply rewarded by the approbation of my fellow citizens, I shall endeavor to deserve a continuance of it by my future conduct. May the same temporal and eternal blessings which you implore for me, rest upon your congregations. Permit the children of the stock of Abraham to approach you with the most cordial affection and esteem for your person and merit, and to join with our fellow-citizens in welcoming you to Newport. ... Deprived as we hitherto have been of the invaluable rights of free citizens, we now-with a deep sense of gratitude to the Almighty Disposer of all events  behold a government erected by the majesty of the people-a government which to bigotry gives no sanction, to persecution no assistance, but generously affording to all liberty of conscience and immunities of citizenship, deeming every one of whatever nation, tongue, or language, equal parts of the great governmental machine. 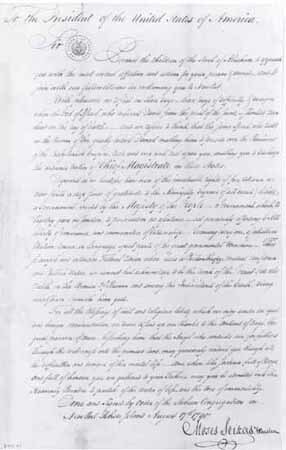 Presented by the Hebrew Congregation in Newport, Rhode Island, August 17, 1790, on behalf of "the children of the seed of Abraham" to the President of the United States of America and written by Moses Seixas, Warden of the Congregation, this address is the actual one received by America's first president. Note that the felicitous characterization of the government of the United States "which to bigotry gives no sanction, to persecution no assistance" that is found (two words transposed) in Washington's response was first used by Moses Seixas. The citizens of the United States of America have a right to applaud themselves for having given to mankind examples of an enlarged and liberal policy-a policy worthy of imitation. All possess alike liberty of conscience and immunities of citizenship. 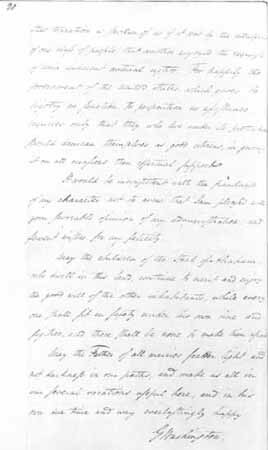 President Washington sent gracious replies in 1790 to the Newport Hebrew Congregation and to the Philadelphia, New York, Charleston, and Richmond consortium, a portion of which we can read in this copy of his celebrated reply to Newport. good will of the other inhabitants. To bigotry no sanction, to persecution no assistance became, through its use by the country's first president, a revered phrase in America's national vocabulary. 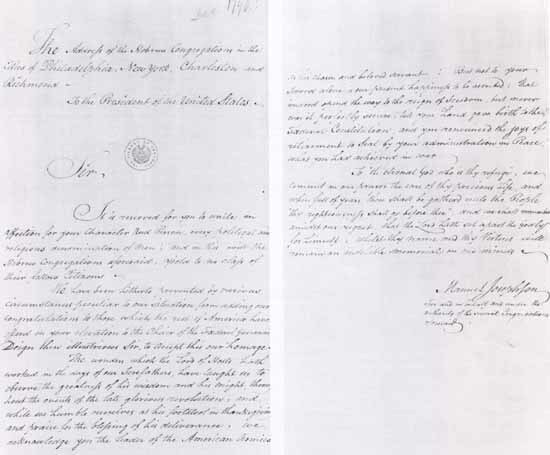 The publication of the Hebrew Congregations/George Washington correspondence in a number of American newspapers in 1790 constituted a public declaration by the Father of his Country of the free and equal status of Jews in America, furthered by its inclusion in A Collection of Speeches of the President of the United States (Boston, 1796). The usefulness of the Washington pronouncements is illustrated by Governor Worthington employing them in 1824 in support of the "Jew Bill," which conferred upon Maryland Jews the full political rights heretofore denied them.